Scroll down to see our selection of pediatric strollers and accessories for sale. Pediatric strollers and accessories are used by parents to easily transport their special needs child safely. We carry a large selection of pediatric strollers and their accessories for sale including Tom standard pediatric strollers, Tom Maxi pediatric strollers, Tom Super Maxi pediatric strollers, the Corzo basic 30, 34 and 38 pediatric strollers and Corzo Xcountry pediatric strollers. What is a pediatric stroller? Pediatric strollers are specialized rolling chairs that allow a chair giver or parent to transport a disable or mobility challenged child. 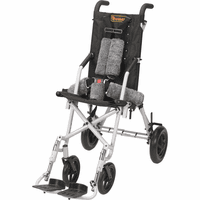 Pediatric strollers are equipped with rugged wheels making unpaved terrain easy to navigate. Most pediatric strollers offer extensive options and accessories to help position and secure the child.